Abstract : In this report we describe a number of overhead estimates a suballocator might incur on 'smaller' memories. The report is mainly aimed at illustrating the strengths and weaknesses when one considers the option of allocation large chunks of similarly sized data to save space. Most memory allocators allocate each individual element as its own 'chunk', containing the size prefixed, potentially some extra meta information and the actual content. When we allocate many small chunks, e.g: 3000 allocations of 40 bytes each, then this size (assumed to be 4 bytes representing the length) will directly lead to an overhead of 10%. Suballocators solve this problem by allocating for each different size of allocations a larger block of memory. Instead of allocating 3000 individual chunks, a suballocator will allocate 1 block of 3000 chunks, leading to a much smaller overhead. Of course there are a number of problems with this approach. First and foremost, allocating larger blocks incurs an overhead of empty space that is, in a statistical sense, not used. And secondly, the extra management information required to find blocks of appropriate size incurs another overhead that must be carefully calculated. The statistics presented below are based on an actual C++ implementation that is available as a package from . The overall memory layout contains 6 starting records. Some of these records point to the root of a number of search trees we deal with. Others form sentinels, to point to the first and last block. After the initial records come a collection of blocks. Each block contains a starting record, which we will describe below, and then a number of 'chunks' (or elements), all of the same size. A block_type which specifies whether the block is a free block, an allocated block or a sentinel. (1 byte). Previous and next pointers to the blocks left and right of the current block (2*8 bytes). The size of the individual chunks in the block (8 bytes). The start of the internal freelist (8 bytes). Because elements in a block can be individually freed, it is necessary to remember which elements are free, so that we can reuse them later on. This information is stored in a freelist, started by this pointer. The number of free chunks within this block. This is mainly useful to remember when the block is again fully free so that we can deallocate the block itself and promote/demoted it to a free one (8 bytes). The left, right and flag for this node in a balanced tree that keeps track of the various positions in the nodes. E.g. The type of query involved is to know to which block address x belongs, with x being an elements address (1 flag byte, 2 pointers for left and right, giving 17 bytes). 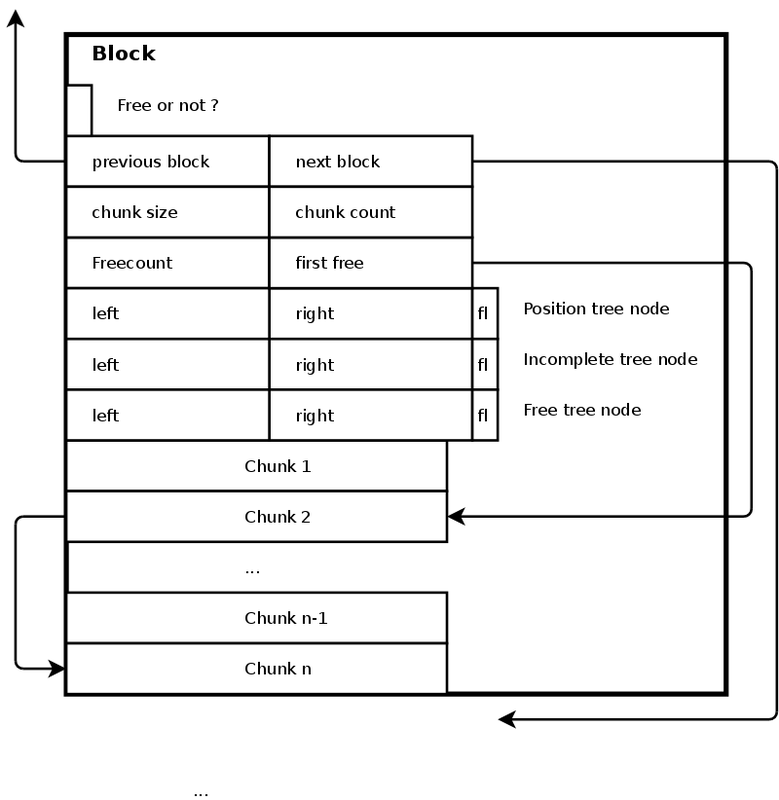 The left, right and flag for this node in a balanced tree that keeps track of the incompletely used blocks (1 flag byte, 2 pointers for left and right, giving 17 bytes). The left, right and flag for this node in a balanced tree that keeps track of all the free elements (1 flag byte, 2 pointers for left and right, giving 17 bytes). It is possible to place the +/0/- flag stored in each node, as a bit in any of the pointers and force each pointer to be a multiple of 4 bytes. That would gain us 3 bytes. The block type itself could also be stored inside the previous / next pointers, again another byte. The presence of the next pointer is also unnecessary since we can calculate the next position based on the elementsize and elementcount. In summary, we can work with 40 bytes (if we deal with a 32 bit memory), or with a 80 byte block header (in case of a 64 bit addressing scheme). When an allocated element is freed again, then that element is added to the front of the list. In case the chunksize is larger than 4 (or 8) bytes, then the freelist can directly point to the actual addresses. A problem appears when the 'next' pointer cannot be stored within the required chunk size. Such situations arise when we allocate blocks that deal with chunks of size 1,2 or 3 (and maybe 4,5,6 or 7). When this happens, it is suffices for most cases to refer to element indices instead of addresses. Even when allocating elements of 2 bytes long, will it suffice for most purposes. However, if we want to go the insane way of allocating many single bytes, then we can be creative and use the freepointer its 4 (or 8) bytes to refer to specific element starts. 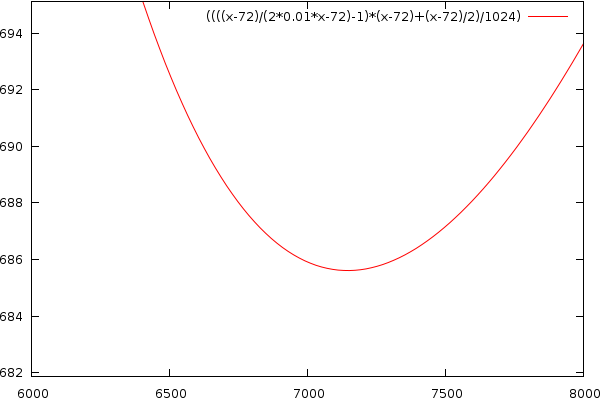 The first byte of the freepointer would then deal with the first subchunk of the block (the first 256 bytes). The second byte of the freepointer would then deal with the second subchunk of the block (byte 256-511) and so on. Using this approach we can only deal with 1024 (or 2048) bytes. It is however a very weird thing to require for the allocation of a simple bytes. Especially because the pointer to such a byte itself would already be longer than the byte. Nevertheless, when programming it can sometimes occur that the programmer does not want to deal with cases where the string is suspiciously short. So therefore we must allow this to occur and we should be able to deal with it. Because the size of a block is a somewhat arbitrary choice. E.g: do we really need to allocate 100'000 single bytes, if a request for a single byte comes in, or might it be more economic to allocate only 1024 elements at a time ? In case we deal with large blocks we obviously do not even want to do that, that would mean allocating 1024 elements of 1Mb ! To deal with this aspect of the statistics it is in general better to try to make all blocks of similar length: E.g 8192 bytes, or 16384 bytes, unless the required element size becomes larger than the blocksize itself. In which case, the block will contain only 1 element. What is the overhead within one block if it has been completely filled ? Both cases will be approached under the assumption that we deal with an blockheader of 36 (in case of 32 bits per pointer), or 72 bytes (in case of 64 bits per pointer), as a theoretical attainable target. We will also be considering different target block sizes. n is the targetsize of each block. E.g: 1024, 2048, 8192, or 16384. n is only useful when we talk about blocks that have elements that are smaller than n itself. c the size of the overhead per block. 36 or 72 bytes. 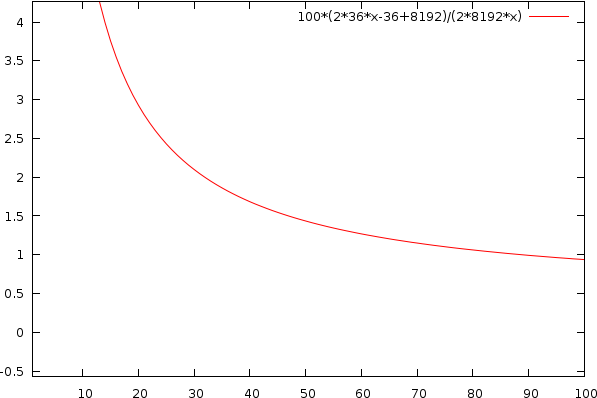 An efficiency of 1% is reached if we store an element of 3564 bytes directly in its own block (32 bit), or 7128 (64 bit). The overhead per block, of length n, is given as the total allocated memory (n) divided by the useful memory (n-c), subtract 1. For elements of size 2, we will allocate 1800 elements (32 bit), 3600 (64 bit). For elements of size 4, we will allocate 900/1800 elements per block. We already figured out that storing an element of 3564 bytes in its own block leads to an efficiency of 1%, and that completely filled blocks with a blocksize must have a size larger than 3636 bytes. The question now becomes, what happens if we have sizes that cannot be easily doubled into a block: E.g: an element size of 3500. If is clearly less than 3564, so we want multiple elements, but we cannot store two of them in 3636 bytes. In this case, it is useful to take the minimum number of elements to be larger than 3636 bytes. If we deal with very small elements of 1 or 2 bytes, we have a limit on the number of elements we can store. If a block of element size 2 we can at most store 65535 elements. This is already much larger than the required minimum blocksize and is thus not a problem. which leads to an overhead of 50.5%. Quite a disaster indeed. This might even be worse. The chance that a single memory allocation of 3023 elements take place is much higher than this element being allocated twice, leading to the question whether we should indeed allocate such not large enough, yet not sufficiently small elements twice. In case the element size is a seldom occurring element (a string of 213 bytes), we will still allocate 3636 bytes, leaving us with an overhead of 94.1%. This is an even bigger disaster. Tuning this type of information might require the ability to split a block when it has not been used for a long time. Another strategy might require us to rely on the memory allocation size distribution, and set an appropriate cutoff value at which point we will no longer allocate multiblocks, instead we might rely on single blocks. If we would need to allocate 2 blocks of the same elementsize, we would of course see this overhead to about 75%, and if we allocate t blocks of a certain element size, then we would be allocating t*n bytes, in which, for the first (t-1) blocks (n-c) bytes are actually useful. For the last block we would have (n-c)/2 useful bytes. Expressed in overhead: for the first t-1 blocks, we would have a total overhead of (t-1)*c, while the last block would have an overhead of (c+n)/2. The drama of this cannot be underestimated. Although the estimates we gave when blocks were completely full, the fact that a block will seldom be complete full requires us to allocate much, much, much more than we originally anticipated. As an example: with 88 blocks needed to allocate, we must allocate 704 Kb to deal with, for instance the 4 byte elements, or the 8 byte elements, and then the 16 byte elements. For each of these potential sizes we must at least have 704kb data to store, otherwise are overhead will be larger than 1%. and we can plot a graph with on the horizontal axis the blocksize and on the vertical axes the kilobytes of data necessary to store, before we will reach that efficiency. Vertical: the required amount of data to store in equally sized elements to reach 1% efficiency, given a certain target blocksize (n), shown horizontally. The memory allocator we presented seems to achieve great efficiency if we compare the used memory against the allocated memory. That is if we assume fully allocated blocks. That is however not very likely to happen. There will always be blocks partly filled, which leads to a drastic reduction in performance. There seems to be a trade off between the target blocksize and the amount of data that needs to be stored before the allocator reaches a certain efficiency. To achieve an efficiency of 1%, the ideal blocksize would be around 100 times larger than the blockheader size. And in that case the minimal amount of data to store to reach that efficiency is about 10'000 times more than the blockheader size. In words: to achieve an efficiency of 1% in a 64bit memory we require to store around 720KB of equally sized elements. This also means that every byte we can remove from the blockheader reduces the required data to store with 9.7 kB. In conclusion, this allocator is well suited for very very large memory requirements. When dealing with a 64bit memory, an optimal dataset will require 9.7 GB of data. 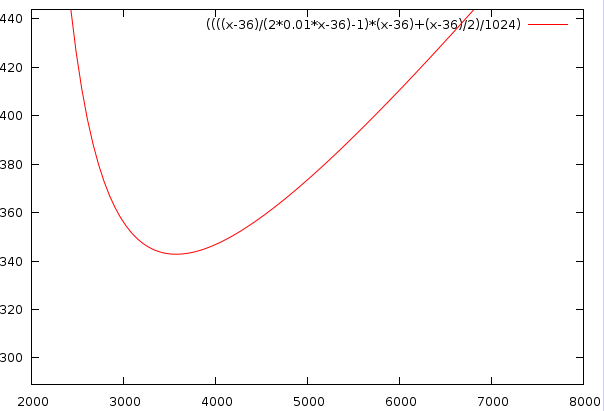 In practice that would, due to the non-uniform distribution of allocationsizes easily jump up 4 orders of magnitude. So when dealing with terabytes (or even petabytes) of information, then this allocator might become efficient. Sadly enough, in such situations, location of data as well as access times (thinking of the balanced tree), might become more of a burden than the speed-efficiency itself. In truth, this was a nice algorithm to work with, a nice idea, but achieving an efficiency of 1% can easily be obtained using other methods, such as adaptations of the dough-lea allocator, using variable sized pointers (local and remote), letting the program deal with block allocations instead of the memory allocator, or a hybrid approach in which block allocation happens only for a limited number of element sizes (e.g: those below 200 bytes).